From time to time, people would like to rip DVD movies on Mac computer instead of taking DVD in and out of DVD player repeatedly, for the purpose of protecting DVD against wear and tear or ensuring an on-the-go enjoyment on iPhone, iPad, PSP, etc. And such process is usually completed with the assistance of third-party software like the renowned VLC media player or a professional yet 100% free DVD ripper for Mac. 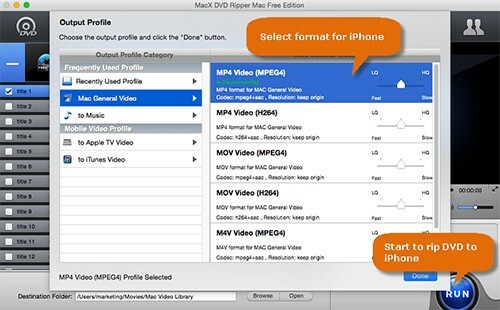 In this tutorial, you will know how to free rip DVD on Mac with VLC player and copy protected DVD movies for iPhone, iPad, Android, etc. with the help of VLC alternative. MacX DVD Ripper Free - the best free DVD ripper for Mac to rip copy-protected DVDs to mainstream formats MP4 MOV and many more for iPhone, iPad, Android, etc at fast speed (hyper-threading & multi-core CPU utility), 50% CPU usage at most, no CPU high usage/overheating problems. Although VLC is more famous for playing DVDs and videos, but the version after 0.9.6 can rip movie from DVD on Mac and PC as well. Before follow the guide below on how to rip DVD on Mac with VLC, go to VLC official site and free download VLC for Mac latest version 2.2.8 and get it installed. It runs on 64-bit Mac running on OS X 10.6 or later. 33 MB is required to store the DMG file. Here we take converting ISO image to MP4 on Mac with VLC as an example. Step 1: insert the DVD you want to rip onto your Mac and launch VLC media player, click on "File" at the top left corner of the main window, then choose "Open Disc..." button. Step 2: hit "Open VIDEO_TS / BDMV folder" tab to load the movie file after the Open Source appears. * ISO Image or VIDEO_TS folder is also supported by VLC as the input format for further movie ripping. * If you don't want any DVD menus, just disable disc menus box to skip them. * To rip a commercial DVD on Mac OS, please make sure to set VLC to skip the DVD title, or else, it'll just keep recording the menu video over and over again, or turn to professional DVD decoder that can tackle the copy protected DVDs. Step 3: Check the "Streaming/Saving" box to enable the Setting option. Step 4: Click "Save as File" > hit "Browse" button to choose destination folder. Step 5: Tap "OK" to start ripping with free DVD ripper for Mac VLC player. After a few minutes, you can get the converted file and play on your mobile devices. MacX MediaTrans for much convenient watching. You are also allowed to backup iPhone file to Mac to expand storage without removing data if your device has no enough free space for the DVD movies. 1. VLC player crashes when ripping dvd. 2. VLC pops up error message "Your input can't be opened". 3. VLC has stopped working during DVD copy process on Mac. 4. It's too long for VLC to rip a full length DVD. 5. VLC cannot cope with copy protected DVDs and it's advised to remove DVD copy protection beforehand. 6. VLC eats up your CPU usage up to 96% or even higher. That would retard your DVD ripping speed, as well as increase burden on other tasks running on your desktop. That's not the end. It would also ruin your CPU processor since the CPU temperature has been driven to 75C or even higher. For mid-pro or expert users, you might need more settings to reach your specific goals. Fortunately, VLC does possess some sophisticated settings for you to customize your DVD conversion quality, speed, size, etc. Go ahead if needed. 1. Adjust VLC Preferences Settings. 1.1. Video Deinterlace: the default setting of "Video Deinterlace" is off. If you wanna your output DVD file with progressive scanning, tap "Preference" > access to "Video" > manually change Deinterlace into "On". Plus, it also offers you with deinterlace mode e.g., Discard, Blend, Mean, Linear, Film NTSC(IVTC), etc. 1.2. 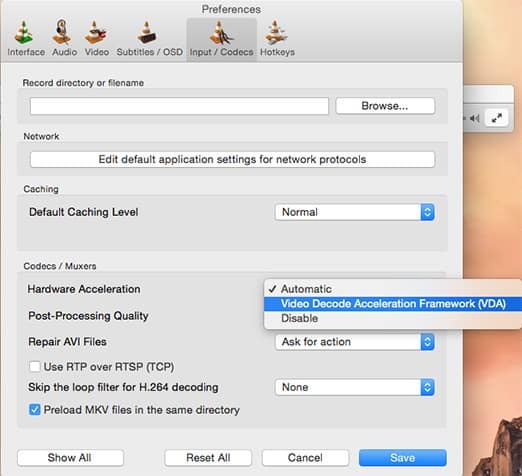 Hardware Acceleration: It's officially claimed that VLC supports hardware decoding with "Video Decode Acceleration Framework (VDA)". However, its default setting is "Automatic", which actually doesn't go into action in real DVD ripping. Though the positive influence of hardware decoding is quite limited, it would be a little bit better to quicken your DVD conversion speed. After all, something is better than nothing. Hence, you're suggested to set up HW Accel. to VDA. 2.1. Encapsulation: normally, MP4 might be your primary choice due to its wider compatibility. Yet, there are still other great video formats available if you know one or two about them. AVI wins a wide wave of popularity because of its high quality and multiple subtitles/audio tracks supported. OGG dwarfs others with high compression efficiency. MPEG 1 overshadows others thanks to its remarkably high quality. Hence, if you wanna keep as high quality as possible, AVI and MPEG 1 are worth your consideration (VLC can support them for playback on macOS). In case output video uploading is the target, OGG sounds great. Video: H264 is at the top of your priority list. The supported video codec list is not ended here, AVI, MPEG-4, MPEG-1, MPEG-TS, OGG, QuickTime also included. Bit rate: it enables you to choose bit rate from 16kbps to 3072kbps. You can freely adjust it at your disposal. Despite VLC provides us a free solution to rip DVD on Mac OS, VLC still lets down for its inability to automatically determine which file on the DVD contains the actual movie - right title. As a result, you have to take some time to load and preview each file in turn manually to get things started. Worse still, VLC seemingly takes forever to rip a DVD on macOS, consumes up to 96% CPU usage and causes CPU overheating problems. In consideration of settling these issues, VLC alternative MacX DVD Ripper Free is highly recommended here, owning to powerful DVD decryption ability, cover-all output format supported and advanced hyper-threading tech & multiple-CPU core (up to 8) utility. Thus, this free DVD converter can rip any DVD (homemade or commercial DRM protected DVD) to MP4, H264, MOV, iTunes, etc. with only 50% CPU usage. 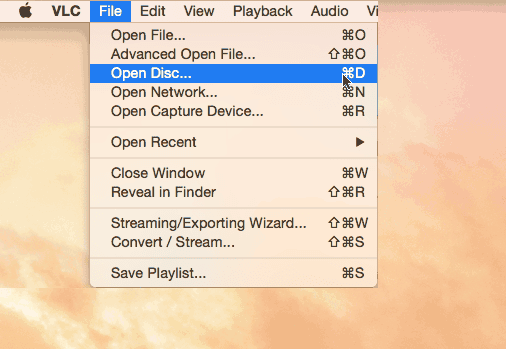 Below is the step-by-step guide on how to rip DVD on Mac with VLC alternative freely. Step 1: Load DVD Movie or DVD Folder. Free download DVD ripper for Mac, click "DVD Disc" to import the DVD movie you want to rip. Select the output format as you desire from the pop-down box. Compared with VLC, the DVD ripper for Mac provides you direct output formats. You can choose to convert DVD to MP4, MOV, iTunes, etc. Note: to relieve CPU burden from compute-intensive task, hyper-threading tech and multi-core CPU utility can render help, which are located at the lower right corner of the interface and auto ticked at most based on your CPU processor configuration. Step 3: Press the "RUN" Button. Click "RUN" to start ripping DVD on your Mac computer. Tips: If you need to rip all copy protected DVDs from Disney, Sony or other publishers and even deal with the knotty discs, MacX DVD Ripper Pro is an excellent DVD decrypter, which is able to decrypt and copy DVDs without manually choosing the full content of DVD movie. It easily strips CSS, Disney copy protection, Sony ARccOS protection, etc off DVD and rips so that you can rip movie from copy protected DVD, including new movies on DVD with 99 titles on Mac, damaged DVDs, workout DVDs, Japanese DVDs easily, and fix VLC cannot rip DVD and VLC won't play DVDs errors. Notice: We only advocate copying and ripping DVDs under the concept of Fair Use and don't encourage any illegal reproduction or distribution of copyrighted content. Please abide by the local DVD copyright law before doing it. VLC won't play DVD, like DVD not loading, VLC can't read DVD, choppy video audio, stuttering/artifacts? Here're some tips on how to solve VLC not playing DVD/Blu-rays. Something wrong with DVD Shrink for Mac when copying DVD? Alright, DVD shrink alternatives would work like a charm on protected DVD copy, backup, ripping and compression on Mac OS. Wanna transfer DVD to iPad, iphone, iPod on Mac? This tutorial will show you an easy solution to put DVD on your fashionable iPad, iPhone or iPod on Mac computer. MacX DVD Ripper Pro is the best VLC alternative which can copy and rip both homemade and commercial DVDs to all kinds of video formats like MOV, MP4, M4V with original quality.